Spread across 2 floors, Hotel Galaxy Inn has 5 AC rooms. Each room has an attached bathroom with a 24-hour supply of hot/cold water and is furnished with a wardrobe. 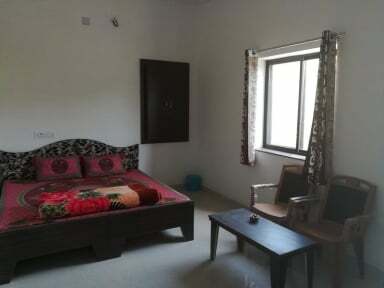 This accommodation in Pushkar provides its guests with laundry, doctor-on-call, ticket booking, and room service. 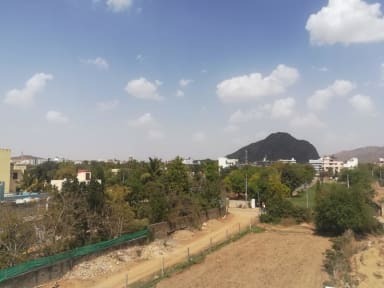 The on-site facilities include a roof-top multi-cuisine restaurant, business center, Hotel Galaxy Inn Pushkar is accessible from the Pushkar Terminus Railway Station (14 km) and the Jaipur International Airport (151 km). Guests can visit the Pushkar Lake at 1 km, Apteshwar Mahadev Temple at 1 km, and Ajmer Sharif Dargah at 13 km. In addition to making arrangements for local trips and camel safaris this property also offers transportation services to its guests. The hotel is new, big and nice but it wasn't really clean. I asked if the hot water in the shower was working and they said yes but it didn't work. When we check in, the staff offer us "welcome coffee" and also gave us a water bottle, we thought it was courtesy, for free, but at the end of the stay they charge as 90 rupees for that. Nothing is free in India! So better ask when they offer something.